OpenGL 3 Hello World Demo. 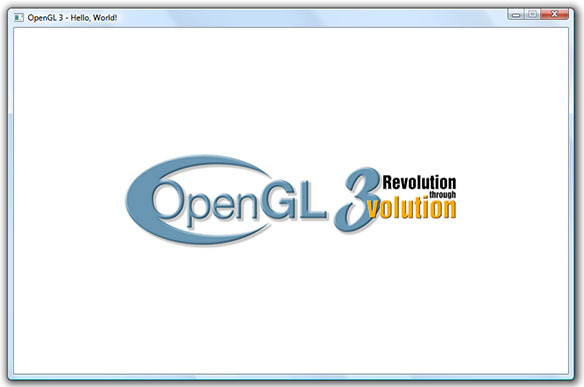 This Windows OpenGL application demonstrates how to render a 2D textured rectangle using OpenGL 3 or a forward compatible OpenGL 3.0 rendering context. 1. This is an OpenGL 3 demo. This demo will not run on OpenGL 2.x and OpenGL 1.x hardware. 2. This demo requires the Visual C++ 2010 Library Runtimes. Download instructions can be found here. Download executable, source, and Visual C++ 2010 solution files. Added missing .vcxproj.filters file to the project. Updated solution to Microsoft Visual Studio 2010.
main.cpp: Moved the vertex and fragment shader compilation and linking logic into the GL3Application class. Changed the type of the Texture2D structure's pixels members from unsigned char to GLubyte. Added the following new methods to the GL3Application class: loadShaderProgram(), programInfoLog(). shaderInfoLog(). Added following new member variables to the GL3Application class: m_shaderInfoLog, m_programInfoLog. Added implementation for the new loadShaderProgram() method. Updated the initOpenGL() method to create an OpenGL 3.2 rendering context when supported. Added initial support for OpenGL 3.2. Added new entry points for OpenGL 3.2. Updated to include changes for OpenGL 3.2 where a profile can be specified when the GL context is created. application.cpp: Updated initOpenGL() method to use the gl::ExtensionSupported() function to query supported OpenGL extensions. gl.cpp: Added new private functions: DummyGLWndProc(), CreateDummyGLWindow(), and DestroyDummyGLWindow(). Updated ExtensionSupported() function to cache all of the extensions returned by GL_EXTENSIONS and wglGetExtensionsStringARB(). The ExtensionSupported() function creates a dummy hidden window with an OpenGL rendering context in order to retrieve all supported extensions. WGL_ARB_extensions_string.h, WGL_ARB_extensions_string.cpp: Removed. Functionality moved into the gl::ExtensionSupported() function in the framework's gl module. Copyright © 2005-2013 dhpoware. All rights reserved.